Sugar free solutions for all your dietary needs! Perfect for people on specific restricted diets. Containing no refined sugar, these assorted candies use mostly natural sugar substitutes to sweeten them. They are however not a reduced calorie food. With these delicious candies, we don't need to give up on enjoying a sweet treat now and again. 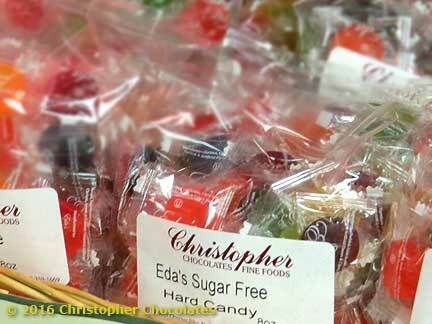 Eda's Famous Sugar Free Hard Candies are perfect for any-time and any-where. Many of our sugar filled chocolates come in a Sugar Free alternative. From chocolate covered pretzels, nonpareils, bridge mix, almond bark, sea salt caramels, almonch butter crunch, coconut cream, almond cluster, chocolate meltaway, cashew caramel patty to chocolate meltaway, there are delicious choices to to take care of your chocolate cravings. 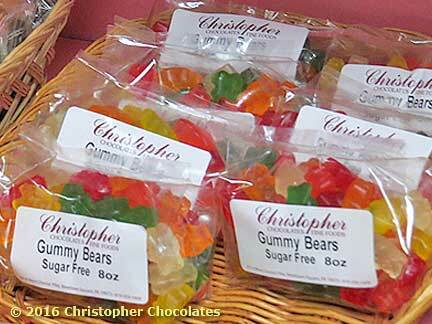 If a chewy candy is more to your liking, we offer Sugar Free gummy bears, cherry chews, chocolate chews and licorice chews. Oh so yummy! 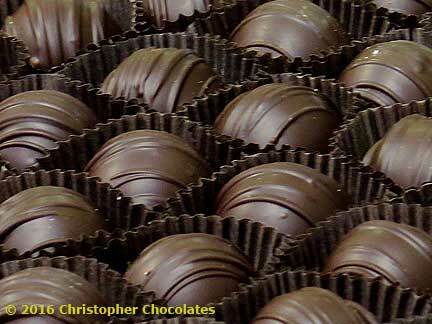 Christopher Chocolates, Inc. & Project Associates.